Due to the many questions that arise from time-to-time regarding motorcycle cruise controls, I decided to write up an FAQ to help answer most of the frequently asked questions. This FAQ is not intended to promote one type or brand of product over another, but to give the motorcyclist an overview of what options are available and how they differ so that an informed decision can be made on which unit is best for your needs. I am not personally connected with any of the companies or products referred to in this article. I have done my best to assure accuracy of the content of this article and apologize for any oversights that may occur. If you feel that any incorrect and/or incomplete information has been included, please let me know and it will be reviewed and corrected as necessary. Q: What is “motorcycle cruise control”? A: OK, this may sound like a dumb question…but there are sometimes misconceptions regarding products that “lock” or “hold” the twist grip in position. These are throttle locks, NOT cruise control. Some products are marketed as “cruise control” but are actually throttle locks. A true cruise control is an electronic device that monitors vehicle speed and/or engine RPM to maintain a consistent set speed regardless of the terrain. Q: Which is more expensive, throttle lock or electronic cruise control? A: Typically, electronic cruise control is more expensive than a throttle lock due to the complexity of the electronics and quantity of components in the kit. However, there are exceptions since a couple of the throttle locks are very high quality in both materials and design. Q: What is the major operational difference between a throttle lock device and electronic cruise control? A: A throttle lock will only hold the throttle in one position. It will not adjust for changes in the road. An electronic cruise control will automatically monitor and maintain a set speed. Q: How does a throttle lock work? A: A throttle lock provides friction resistance to the twisting motion of the throttle grip. This resistance is adjustable to provide proper “holding” of the throttle while still allowing the throttle to be manually increased or decreased. A throttle lock is engaged and disengaged manually. Q: How does an electronic cruise control work? A: Electronic cruise control units monitor vehicle speed and/or engine RPM to maintain a constant user-selected speed. The cruise control kit typically consists of a servo/brain unit, throttle cable and associated wiring. The cruise is engaged manually by pressing the “set” button at the desired speed. It is disengaged automatically when the front or rear brake is applied or the clutch is disengaged, or can be turned off manually at the switch. Q: Aren’t electronic cruise controls on motorcycles dangerous? What happens if an emergency situation arises while the cruise is engaged? A: NO. An electronic cruise control on a motorcycle operates no different than on your car. The cruise will automatically disengage when the brakes are applied and/or the clutch disengaged. On units where engine RPM is monitored, the cruise will also automatically disengage if it sees a sudden rise in RPM not created by manually twisting the throttle. An example would be if you hit a slippery spot in the road causing the rear tire to suddenly spin, the cruise will disengage. Q: I’ve heard that the “resume” feature should not be used on a motorcycle. Is that true? A: NO. Resume works exactly the same on a motorcycle as it does on a car. Some people with no motorcycle electronic cruise experience claim that using resume will cause the cruise to pull full-throttle creating a dangerous situation, particularly if engaged on an on-ramp or curve. This is not true. If resume is pressed at a speed lower than the set speed, it will accelerate back to the set speed, but it does not go to full-throttle. However, common sense should prevail. It is not recommended to use the resume feature in potentially hazardous situations such as tight curves or on slick roads. To err on the side of caution, I also do not press resume until I am within 10-20 MPH of my set speed. Q: If I use a throttle lock type device, what happens in an emergency situation? A: Well, that depends on the type of throttle lock. I know of one brand that has an automatic disengage feature, but it only works when the front brake is applied. Most designs require that you either manually release the throttle lock (typically using a thumb lever) or manually rotate the twist grip backwards. This is one extra step that would need to be remembered in a panic situation if the throttle lock is engaged. Q: How difficult are these to install? Can I do it myself? A: The answers to these questions depend entirely on the type of unit and your level of mechanical expertise. Throttle locks are typically fairly easy to install and can be accomplished by the average motorcyclist with minimal mechanical experience and simple tools. 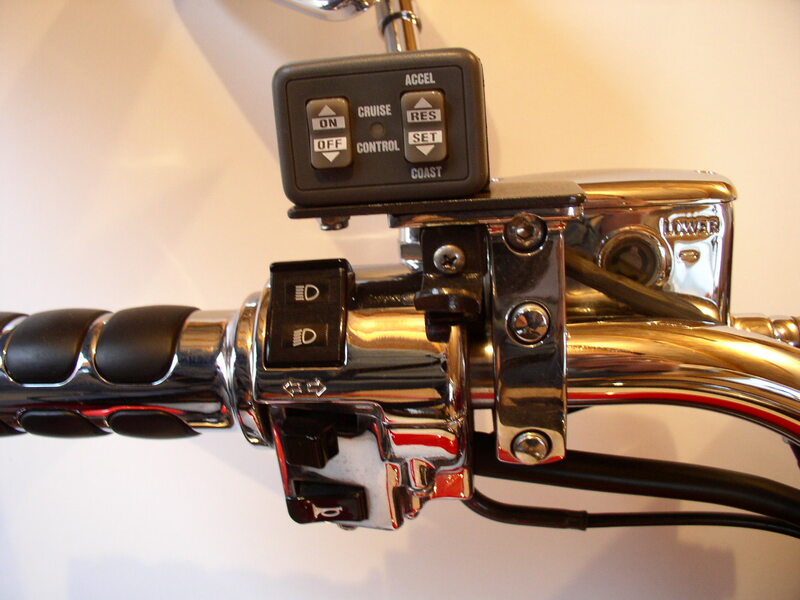 The electronic cruise control units are more complicated, requiring some disassembly of the motorcycle, wiring connections and, in some cases, minor fabrication. If you can follow instructions and are not afraid of taking your bike apart, you can probably install it yourself. If you have any doubt in your abilities, seek out a qualified motorcycle technician. There are a large number of VRCC members that have installed electronic cruise control themselves and are available to help if you should run into a problem. 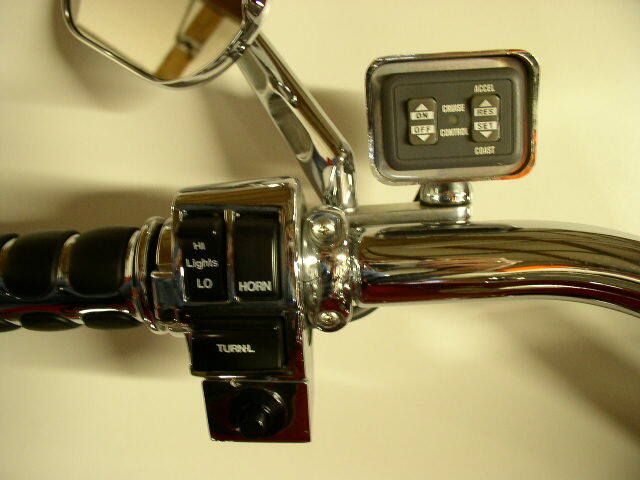 Q: Some of the electronic cruise control kits refer to a “VSS” connection. What is “VSS”? Does my bike have it? If not, do I need it? A: “VSS” stands for “Vehicle Speed Sensor.” This is a sensor at the wheel that sends the speed signal via electrical wire to an electronic speedometer. If your bike has a cable driving a mechanical speedometer, you do not have a VSS. Most modern electronic cruise control kits will work with or without a VSS. Some kits include a wheel speed sensor that can be installed, but may not be necessary. See next question. Q: If my bike does not have a VSS, how does the cruise control monitor vehicle speed? A: In a situation where a VSS is not used, certain cruise control units are designed to monitor engine RPM via an electrical connection to one of the ignition coils. In this instance, the cruise does not really know the vehicle speed; it only knows what the set engine RPM is. However, on a vehicle with a manual transmission, the drive wheel is mechanically locked to the engine through the clutch. Any changes in wheel speed are directly related to changes in RPM and visa-versa. On a vehicle with an automatic transmission and a torque converter, the wheel-to-engine connection is not locked and vehicle speed is not directly related to engine RPM due to slippage in the torque converter. Since most motorcycles have a manual transmission, the VSS is not required, although VSS or a wheel speed sensor can be used if desired. On motorcycles with automatic transmissions (such as the old Hondamatics or Boss Hoss), a VSS or wheel speed sensor is necessary. Q: Is there an electronic cruise control designed for motorcycles? A: YES. I know of two. One is the MC Cruise made in Australia and is available for a number of applications including the Honda Valkyrie. The other is designed for Harley Davidson applications. Q: I’ve heard that the automotive aftermarket Audiovox CCS-100 cruise control kit can be adapted to a motorcycle. Is that true? A: YES. The Audiovox CCS-100 works very well in a motorcycle application and is a good value. However, it does require some minor fabrication of mounting brackets. It also requires a vacuum storage canister and check valve. Q: Are there any instructions to help me if I decide to adapt an automotive aftermarket cruise control unit to my bike? An addendum for the Valkyrie is included. Q: Where can I find additional help if I have a problem with installation of the MC Cruise or the Audiovox CCS-100, or even a throttle lock device? Q: If I have a problem during installation, will the cruise control manufacturer’s tech line help? A: Maybe. If the unit you purchased was sold specifically for motorcycle applications, then the answer would be yes. If you are adapting an aftermarket car unit, then the manufacturer’s tech line will probably refuse to help once you state that you are installing on a motorcycle. They will probably even tell you it will not work. Of course we already know that it will, but since they are not marketing their unit for motorcycle use, they do not want any potential liability. If you have a problem that you think may be a defective component and need a factory replacement, do not tell them it is installed on a motorcycle. Q: Will the Audiovox CCS-100 electronic cruise control work with LED brake lights? A: YES. However, if you have ONLY LED’s for your brake lights, it will be necessary to add a SPDT relay to the circuit between the brake light switch and the cruise servo. The cruise is grounded through the brake light bulb. This ground is “broken” when the brake is applied (bulb lights) and this is what cancels the cruise. Since current will only flow one way through an LED, no ground is seen by the servo and the unit will not work. The relay will bypass the brake light, providing ground to the servo for normal operation, but will cause the ground circuit to open when the brake is applied, thereby canceling the cruise. If you have a combination of incandescent bulbs and LED’s in the brake lamp circuit, a relay should not be needed but can still be used if desired. Q: I don’t want the cruise to look like it was “tacked on.” Can the units be hidden? A: Manual throttle locks range from around $30 to over $100. Electronic cruise control kits range from around $100 to over $500. For professional installation of an electronic cruise control add $200-$300. Q: Where do I buy? A: I have provided a number of links for both throttle lock type units and electronic cruise control kits. Most of these products are available through local dealers, motorcycle accessory shops and online stores.